Yes, the Syrian crisis is still going on. Playwright Henry Naylor reminds the audience of this in his arresting play, Borders, playing as part of New York Theatre Workshop’s Next Door series. In his statement in the program, Naylor reveals that a trip to Kabul in 2002 put an end to his 20-year career as a satirical comic in the UK. Having lost the capacity to find comedy in the news, he wrote a series of plays pointing out the West’s relationship to the Middle East. Borders is one of these plays, and it earned him praise at the Edinburgh Fringe Festival. Similarly to the playwright, one of the two leads in Borders encounters a career-changing moment in a foreign country. Sebastian Nightingale is an early career photojournalist in search of the shot that will change the world, and – why not? – his life, too. During a trip to Pakistan, he meets the legendary photojournalist, John Messenger, who teaches Sebastian about the importance of being at the right place at the right time. Luckily for Sebastian, it turns out that Messenger will lead him directly into a serendipitous moment where he will capture history; Sebastian snaps a picture of a little known war lord whose infamy could not as yet be predicted in 1998: Osama Bin Laden. Meanwhile, in Homs, Syria, a young woman joins the resistance. She refuses to reveal her name, calling herself Nameless. Nameless is a hardened artist. She has lost her father to the Assad regime and is recruited by 19 year-old Rifat, who sells her art supplies. They need artists for the revolution, to paint the walls with images of dissent. It’s a dirty, dangerous job, but Nameless is up for it. Armed with a paintbrush, she will avenge her father and save Homs, her home. Sebastian and Namesless’ stories are interwoven through monologues that travel rapidly through time and place. We bounce from him to her with the help of simple yet adroit lighting design. The choice to not include a sound design was perplexing and a noticeable absence. The characters’ worlds float further and further apart as, post 9-11, Sebastian’s lucky shot of the world’s “Supervillain” propels him into fame and money. Nameless, still in Syria, loses her canvas along with the revolution as jihadists take over the streets of Homs. Nameless is pregnant and angry in the endless violence that surrounds her, while Sebastian is snapping pictures of the most glamorous faces of pop culture. While Nameless’ walls fall to rubble Sebastian grows thick barriers around his heart and mind, trading his noble goals for a frivolous, lucrative career. Graham O’Mara, who plays Sebastian, portrays this conflicted man with finesse and sensitivity. His anguished eyes reflect the internal struggle of Sebastian, while his posture maintains the defensiveness of a man who knows he’s become a sellout. O’Mara is captivating and his comedic timing is a welcome retreat from the play’s heavy subject matter. As Nameless, Avital Lvova is singular in her ability to take the beautiful poetry of Naylor’s text and deliver it effortlessly. She conducts the audience from one peripeteia to another with her deft movements and emotional depth. 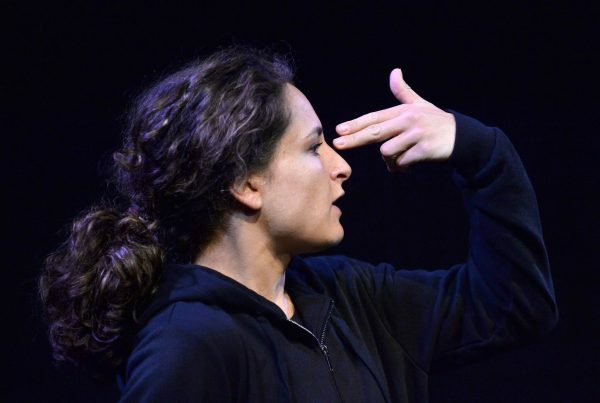 Lvova is athletic, gripping, and her performance is doubtlessly the highlight of the play. In one particular monologue, Nameless barely escapes jihadists and transforms into an embodiment of defiance in the back of her runaway car. Lvova’s delivery is tough and memorable. Borders is co-directed ingeniously by Michael Cabot and Louise Skaaning, who make great use of the barebones set (two stools, that’s it) to transport us from bus to basement to prison to art gallery to boat. Cabot and Skaaning elegantly shift our focus from country to another as expertly as a skilled photographer might. Their choices are helpful in guiding us through these two storylines. We are ushered through Naylor’s text thanks to elegant transitions and brilliant performances. We are confronted with realities we abjectly ignore. Messenger reminds us: when we give in to empathy fatigue, when we give over to apathy, then Osama wins. He might be buried at sea, but as long as he shares that water with the asylum-seekers drowning in the Mediterranean, as long as we forget the hundreds of thousands of lives suffering in Syria, he is victorious. Borders runs to July 22, 2018. More production info can be found here.